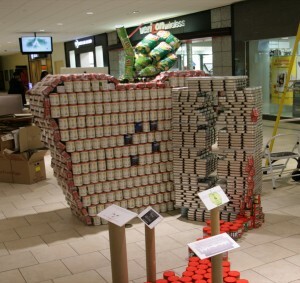 Home » News and Notes » It’s CANstruction time! De Biasse & Seminara Architects will once again be participating in this year’s New Jersey CANStruction event. Architects, engineers, designers, contractors, students, and local community members to build imaginative sculptures mostly out of canned food. All the food that is used in CAN-structing the sculptures for the competition will later be donated to the Community Food Bank of NJ. The theme of the competition this year is Forms of Communication. If you received an individual email from us then you are in the select group of past participants – if you are reading this here we’re reaching out to you help in our fundraising this year. Build night is October 8th. The judging and awards will occur the following day. All builds happen in designated public spaces at the Livingston Mall in Livingston, New Jersey and will be on display for a about a week following the awards. Last year our Halloween-themed creation won the coveted “Juror’s Favorite” spot. all donations will be used to purchase cans to construct our CANsculpture before being donated to the Community Food Bank of NJ. Thanks for your support! It is greatly appreciated by us as well as the men, women and children seeking food assistance throughout New Jersey.